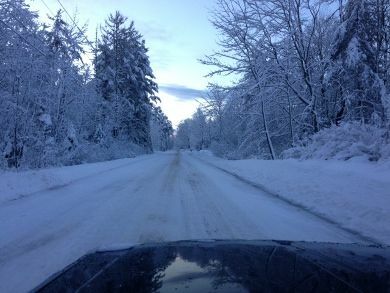 GORHAM, ME - The 2013 Maine 2 Meter FM Simplex Challenge took place on the 10th of February, only a day after the Northeast was struck by one of the biggest blizzards in recent memory. The contest saw an upswing in partcipation, especially around the Bangor area, and despite the challenging road conditions, a considerable amount of mobile activity. 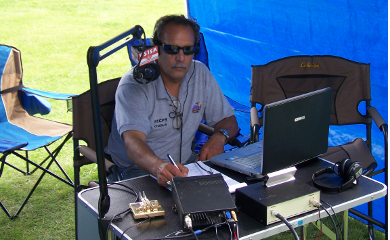 One May 5th, WSSM members will teach a 3 hour course introducing Amateur Radio, designed to launch students on the path toward earning their first ham radio license. The course will be held from 6-9PM at the Old Orchard Beach High School, located at 40 E. Emerson Cummings Blvd., in Old Orchard Beach, ME. Pre registration is required. For more information, or to sign up online, please click here. 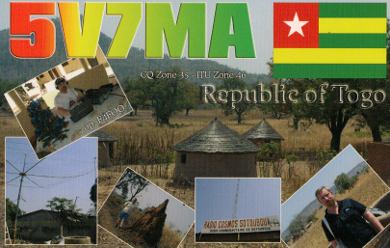 Here's an interesting QSL card from the Republic of Togo. (by KB1HNZ on 15 meters SSB). GORHAM, ME - At February's club meeting, we continued our latest project, which is a simple device that can be used with any handheld or mobile transciever to send modulated CW. 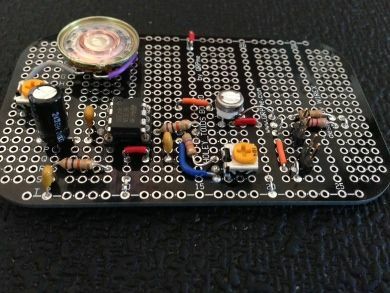 It's basically an audio oscillator and keying circuit which acts as an interface between a CW key and a radio. As members have begun to finish their projects, we've had a chance to see some of them completed. Click on the link below to see pictures of the construction process, and for more information on how you can build one yourself. The WS1SM team is ready to kick off the season with an expedition to Mt. Agamenticus, in York, ME, to activate the mountain for Summits on the Air (SOTA). The event will take place on Sunday, April 28th, and will include operations on both VHF and HF. Frequencies will be announced on the SOTA Watch website as well as via Twitter. For this issue, we're introducing a new regular feature, which will profile different WSSM members, interview style, by asking questions about their involvement in the hobby and some other things you might not know about them. For the first feature, we've chosen Charles Sheppard, W1CPS. Check out the ads on page 2 to view items for sale, upcoming hamfests, announcements, and wanted items. The Wireless Society of Southern Maine would like to welcome new members: Bert Dumont, KB1ZLV, of Greene, ME, and Dana Littlefield, KB1ZLU, of Strong, ME. In recent years, across the country, there have been a number of laws proposed that could have been detrimental to Amateur Radio, if not addressed. A lot of times this happens out of shear ignorance on the behalf of lawmakers. The ARRL and its lobbying force are good at keeping a watchful eye on what is taking place in Washington - for example, opposing such bills as H.R. 607, which aims at “addressing certain spectrum management issues including the creation and maintenance of a nationwide Public Safety broadband network.” But it’s on the state and local levels, that clubs like ours need to take a more active role in monitoring what's being presented. The bill goes on to specifically exempt operators of emergency vehicles, physicians, holders of commercial driver’s licenses, and select municipal employees from any penalty - which begs the question as to why commercial drivers especially, who have the potential of being the most lethal since they operate vehicles containing passengers, hazardous materials, and not to mention, considerable weight, would be exempt. I think all of us would feel more comfortable with LD68 if it contained language which specifically made an exception for the use of radios by licensed Amateur Radio operators. Amateur Radio plays a vital role as a support communications service during emergencies, volunteer activities, and for personal communications. We need to protect this freedom so that we can continue to apply our communications skills where needed. Please take a moment to contact your local Representatives and State Senators to make them aware of this concern. To find contact information for elected officials, by state district, please click here. This email was distributed by the Wireless Society of Southern Maine, P.O. Box 174, Scarborough, ME 04074. If you believe you received this in error, please send an email to: [email protected] to be removed from our mailing list.